This week Microsoft dominated the tech hardware news. Yeah they had the expected chest beating about how awesome their OS was doing (Google and Apple do the same thing) and showed off their new Lumia phone handsets, but had some HUGE surprises aimed squarely at Apple. In fact, by the end of the presentation they did everything but an actual mic drop. They announced the return of the Lumia Phone, in the form of two flagship phones, the 950 (5.2 inch for $549) and the supersized 950XL (5.7 inch for $649). They both come with beast mode 20 megapixel rear cameras. And they’ll run Microsoft’s yet-to-be-released Windows 10 Mobile. Oh, there’s a budget-friendly sibling too, the Lumia 550 which will sell for $139. They’ll be available in November. I’m sure they’ll be cool, especially if you want to stay in the Windows environment. It’s getting harder to get excited about phone specs though these days. Ummm….apparently Microsoft hasn’t given up on trying to use your smartphone as a computer. 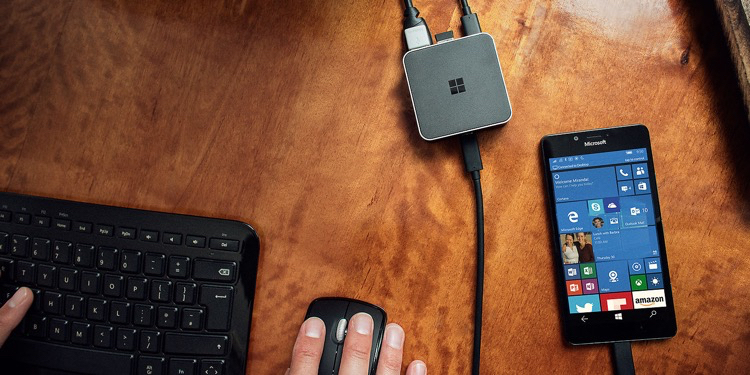 With the Display Dock you can plug in your new Lumia to a DisplayPort or HDMI monitor and has 3 USB ports, including USB-C. So now you can connect a mouse, keyboard and external drive to your phone. Microsoft didn’t include pricing information but if you’ve been dying to use your phone as your primary computing device….there you go. Cool tech, but not sure how often I’d actually use this – curious to see reviews once it’s out. According to Microsoft they see this product being popular in emerging markets where not everyone has a PC and the smartphone might actually be your only computer. Verdict: Meh for the US. Pretty cool in certain situations. Verdict: I’m intrigued, but the price is $50 too high at least. It still looks cool, they showed off an FPS game that was cool and underplayed the HoloLens’ limitations. They announced dev kits will be available and will be untethered so you won’t need to connect to PC with cables to run the things. Apply now and it can be yours for a mere $3,000. I’m not too excited because as with all VR stuff, I’m pretty sure it’ll make me hurl. It’ll be fun for most people though…eventually. Verdict: Very cool tech, but still early days for VR. Hold on, now it’s getting interesting…The promise of the Surface tablet has finally arrived I think. As with the other Microsoft hardware, it’s a tech beast. They all come with a 5 and 8 megapixel camera, USB3 port, microSD card slot, Mini DisplayPort and runs Windows 10 Pro. The entry level ($899) includes an Intel Core M3 processor, 128gb storage AND the Surface Pen. Whew! The entry level iPad Pro on the other hand looks kind of sad in comparison. No ports, runs iOS not OS X, only one processor option, and only 32gb storage. (Don’t even get me started on why Apple still includes 32gb for their tablets and 16gb for their phones as options). You have to pay an extra $100 for the Stylus and an extra $150 to jump up to 128gb storage. So while the iPad Pro starts at $799, to get comparable to the entry level Surface Pro 4 you’re looking at $1,050. Also, the Type Keypad has backlit keys, a touchpad and a fingerprint scanner for $130, $69 less than Apple’s Smart Keyboard which has none of those things, although it is pretty. They’re pretty similar in terms of screen resolution, size, weight, etc. Verdict: Microsoft looks like it has a winner. It really comes down to whether or not you’re all-in with iOS or not and if you want the flexibility of ports. If that’s not you, the Surface Pro 4 may be the tablet of your dreams. Boom. Microsoft announced their first-ever laptop. A convertible to be precise – so you can separate the keyboard from the screen if you just want to use it as a tablet. And the specs are pretty decent. During the reveal, Microsoft tried to pull a fast one. They claimed the processor in the entry level Surface Book was twice as fast as the entry level MacBook Pro. Well actually….that’s only true for the higher end models that include the discrete GPU. Apple doesn’t offer that feature except in the 15” MacBook Pro models. 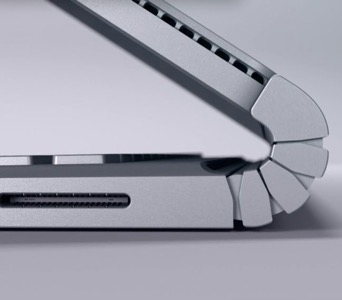 The main design difference was in the new hinge Microsoft designed. They call it the dynamic fulcrum hinge and it’s how you can separate the screen from the keyboard base. Seems to work pretty smoothly, but prevents the lid from closing completely flat when closed. It’s also segmented so doesn’t have as clean a look, in my opinion. Don’t forget that the Surface Book comes with some features that you don’t get with the MacBook: Removable keyboard, a touchscreen interface, and the Surface Pen. Depending on how much you like it, Apple’s touchpad has Force Touch. Now, this comparison is with the entry level products. If you max out the specs both Apple and Microsoft’s laptops approach $3,000. The Surface Book 16GB, 512GB SSD, Core i7 model weighs in at $2700 while the 15” MacBook Pro with similar specs sets you back $2500. At the high end, the Surface Book components clearly outperform the MacBook, due in large part to the fact that the components are a full generation newer. Verdict: Microsoft looks like it has a winner again. With the caveat that there aren’t any real reviews available yet, it really looks like Microsoft hit it out of the park with their first laptop. Would I get it now? Nope, wait for the reviews, don’t forget this is first generation stuff from Microsoft. The Lumia phones are good but not game changing and the Band 2, Display Dock and HoloLens are all potentially great products but it’s too hard to call at this point. Where Microsoft really crushed it was with their new Surface Pro 4 and the Surface Book. The really great thing is that even if you don’t want a Windows laptop or tablet, you can bet that this is going to light a fire under Apple. It’s probably too late to make a difference in their next release, but Apple is really going to have to step up their game now. Competition is good. I can’t wait to see how Apple responds – it’s a great time to be a consumer. It was only a matter of time. 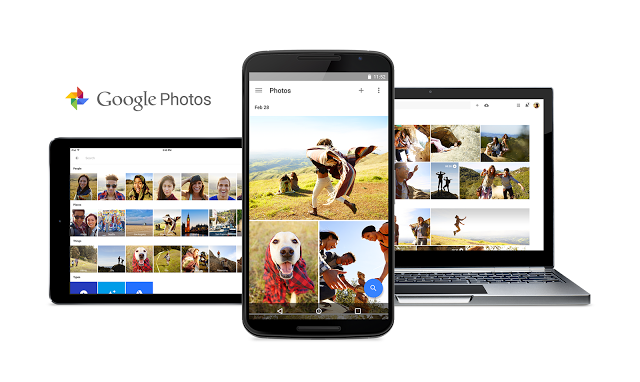 Google Photos is the latest service to offer to store your photos for free or as a bundled feature, joining Amazon and Flickr. Google announced today (in a move that surprised no one) that it was breaking out the Photos feature from Google Plus, making it a standalone product. Another in a long line of signs that Google Plus is not long for this world (I’m waiting for Google Hangouts to jailbreak next). The service will be available for iOS, Android, web and desktop users today (although the iOS app wasn’t available when I checked) and will automatically back up your photos from any of your devices to Google’s cloud. There is a limit though, the free option will only support up to 16 megapixel photos and 1080p videos, which is fine if you only take photos with a point-and-shoot or mobile device – anything higher than that limit will be down-rezzed. If you take photos with a DSLR, and you want to maintain the original resolution you’ll need to continue using your Google Drive storage (15gb for free, but you have to pay after that). I’m also assuming that raw format images will continue to be supported. The Google Photos service will also leverage and improve Google Plus’ “auto awesome” and sorting features, so it should be a lot easier to find photos by person, place or event, even if you don’t tag the photos manually (they made a point of saying the auto-tagging will be private and only available to you for what that’s worth). It will also try to build montages and albums for you if you like – that feature is actually pretty cool in Google Plus, so I’m looking forward to seeing the improvements in Google Photos. While I’m sad to see the inevitable dismantling of Google Plus (doomed for a long time), Google Photos is a great standalone service for shutterbugs of all types. If you’re already paying for Amazon Prime, that means you can store virtually all your photos for free in three different places, so now you have absolutely no reason to lose any of your photos or videos. There’s the standard Over The Air (OTA) method that most people will use. You may need to have significant space free (I’ve seen elsewhere that some people needed over 5gb free!) on your device for this method. You’ll get the space back once the install is complete though. Another way to do it is to update via iTunes. This is a handy method if you don’t have enough free space and also a quick way to back up your device if you’re not using iCloud. Finally, Apple has heard our complaints and improved the features of the notification system. They’ve added some new gestures that allow you to respond in various ways to incoming messages. Previously, you could only swipe to open a message, but now, you can swipe up to dismiss, pull down to reply, etc. This interactive notification system will be utilized by other apps (including 3rd party), not just iMessage. 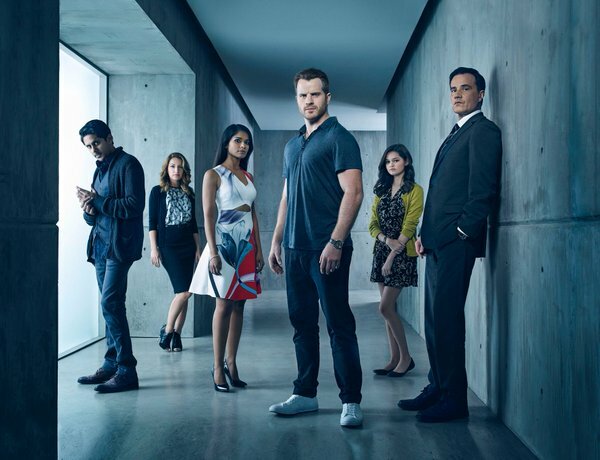 Now I might have a reason to turn Facebook and Twitter banner alerts back on…. Labeling! Yep, now you can label your group messages! Just click on the “Details” button and if you’re in a thread with multiple people there’ll be an option to add a label at the very top. You can also add people to an existing group conversation here. Even more awesome, you can elect to LEAVE a group conversation now. Oh wow, now you can send audio messages from within iMessage. Apple’s finally caught up to WeChat from two years ago….yawn…. 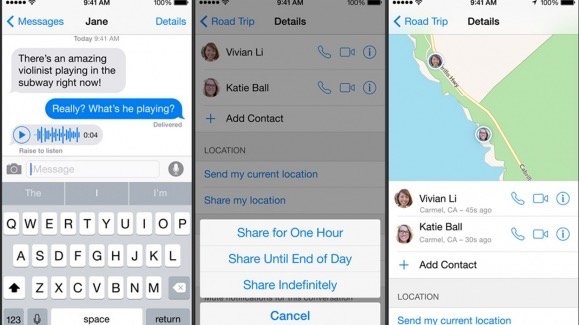 You can share your location for different lengths of time with individuals AND groups now. Pretty useful if you’re on a trip or going to a large event. Again, just click on the “Details” button and you’re given various options. I’ll skip the discussion of privacy ramifications for now…. Hallelujah! Apple has finally added a mute/Do Not Disturb mode for messages. One big improvement here….Attachments! Now when you want to find a photo that you’ve previously sent you don’t have to dig through the entire thread. Click on the “Details” button (told you it was awesome) and at the bottom of the screen, you’ll see ALL the photos that were attached to various messages. VERY cool. Supposedly you can attach comments to photos you send as well as expiration time periods, but I didn’t see that option. The latter would be awesome (not for that, get your mind out of the gutter) for the times when I send a picture to ask a question (I often ask my wife which product she wants me to pick up at the grocery store as an example). I don’t really need to see that photo ever again after say 30 minutes. [UPDATE] I haven’t been able to send any photos at all, so not sure what’s going on with that…. Bizarrely, you could never see time stamps before, but now you can check to see when a message was sent or received. Just pull (anywhere in the thread) to the left and the time stamps will appear. You now have the option to auto-expire your messages. The default is to keep forever, but you can set to one month or a year. Handy to save on space if you’ve got a 16gb model. 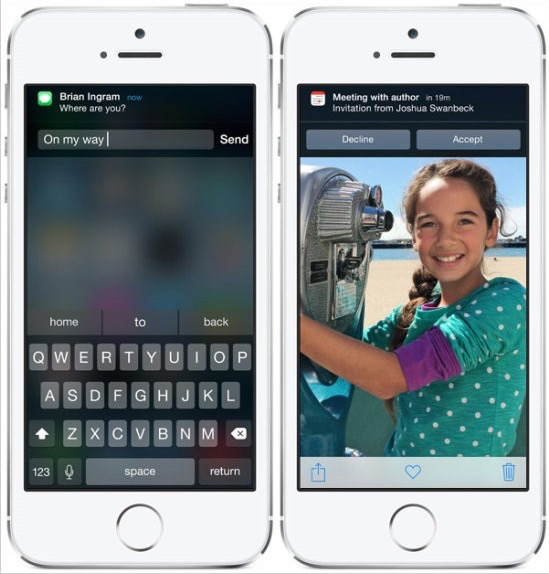 Audio and video messages are set to autodelete after 2 minutes, but you can change those defaults as well. Fairly minor, but kind of cool. Double-click on the Home button, and your most recent contacts show up on top of the screen. You can call or message them by clicking on their icons. Now you can easily identify your battery hogs! This information is available in the Settings\General\Usage\Battery Usage page. Couple of improvements to Siri: Hands-free “Hey Siri” mode is now an option when your device is plugged in to power. I’m assuming this means that the microphone is always on for this to work. Also, as previously announced, Shazam is now integrated into Siri so you can ask Siri “What song is this?” Or, you could just fire up Shazam or SoundHound and have those apps do the same thing…. There’s a new feature called QuickType that will contextually (attempt to) predict what word you’re going to use next. They show up in little boxes above the keyboard. With my limited testing, the new feature works pretty well and might spell the end of those played out autocorrect memes. You’re supposed to be able to load 3rd party keyboards too, but I haven’t had a chance to try that yet. I wasn’t going to talk about Mail because I don’t typically use it (I’m using Mailbox right now) but they made a couple of improvements, one of which is kind of cool. The first is that they added more shortcut options when you swipe to the left. That feature has been in a dozen other mail apps for a long time. They have added a new notification option that lets you know when someone responds to an email thread…that’s kind of cool. Probably not enough to get me to switch back but, kind of cool. This one is pretty big. You can share all your app purchases with family members, even if they have their own AppleID accounts. HomeKit and Health App – Both of these features have very specific hardware accessory requirements. I’ve got the new Health app on my phone….but with no fitness tracker, this one’s pretty useless right now. iCloud Drive – Not going to switch until OSX Yosemite is officially released as iCloud Drive and the existing iCloud service aren’t compatible. I didn’t have a chance to test everything unfortunately, but so far it’s a great improvement over iOS 7, with a lot of really cool new features. Not a lot that is major, you understand, but really solid updates. I have no issues running the new OS so far on my iPhone 5 so I’d recommend it provisionally – I can’t wait to see if anything is massively broken in the next few weeks. According to Apple, size does matter! Well, the new iPhone was announced this week and I’m not going to lie, I was CONFLICTED. I love the 4” form factor and really didn’t want a bigger phone. On the other hand, the iPhone Huge (as I call it) was clearly a better phone, at least from a technical standpoint. The preorders started last night online (sold out now) and you can pick up the phones themselves next Friday. Well here is my summary of the two phones, from a physical standpoint, at least. Other than the obvious size bump, the physical design changes are fairly subtle. Apple has gone further away from the squarish design of the 4 series and it’s curvier and more rounded on the corners. They also moved the power/sleep button to the right side from the top to make it easier to reach. The ion-strengthened (whatever that really means) glass face (not sapphire as rumored) is slightly curved. Obviously, they’re bigger in almost every dimension. Both phones are slightly thinner than the 5 series, but more importantly, the two new phones are also heavier than the 5s. The new chip(s) are supposed to be faster at both core and image processing all while being significantly more energy efficient. The new motion chip adds elevation detection too. Apple didn’t give exact specs for the new batteries, but are rumored to have a 2,915 mAh battery in the 6 Plus and 1,810 mAh battery in the 6, as compared to the 1,570 mAh battery in the 5S. 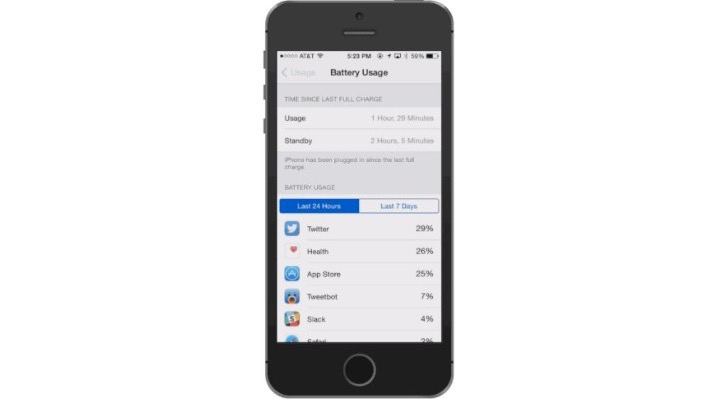 They did give estimated times for various tasks – as an example the 3G talk time for the 5S is 10 hours, which will potentially reach 14 hours on the 6 and 24 hours on the 6 Plus! Obviously these aren’t real world stats, but still! 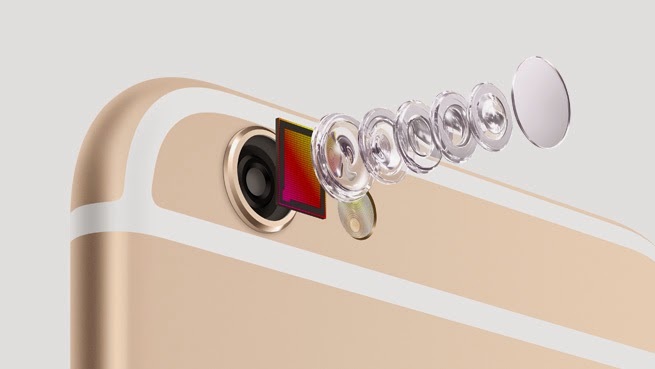 No bump in the megapixels or aperture (still 8MP f2.2), but both of the new phones include improved iSight sensors which include “focus pixels” which use phase detction focus and is supposed to improve autofocus speed, skin tone, face recognition and macro photography. One of the major differences between the two phones is that the Plus model gains optical image stabilization. Panoramic photos are now at 43 megapixels up from 38. No major changes in specs, as the megapixel count remains the same but does get a change from the f2.4 aperture to f2.2 on both phones. Face recognition is supposed to be improved and there’s a new burst mode for all you selfie nuts. No huge changes, but Apple has added the option of recording at 60fps and 240fps (super slo-mo) and something called cinematic video stabilization in addition to the regular video stabilization. Connectivity: The new models will all support Voice Over LTE (VoLTE) which results in better call quality if your carrier supports it (it’s coming to all carriers eventually). Also announced were enhanced WiFi performance, support for the 802.11ac standard, and WiFi calling, which allows you to make calls over WiFi instead of cellular, kind of like the MicroCells that AT&T sell. This feature will be supported on the 5S once you move up to iOS8 I guess. Well, Apple really did it this time, announcing not one but TWO new phones that were vastly different in size and slightly different in capabilities. Last year it was an easy choice between getting the iPhone 5S (the choice of right thinking people) and the iPhone 5C (the choice of the other people). THIS year, it’s a lot different. First of all, you can’t get the new version of what you currently have as a 4″ version doesn’t exist. Thankfully, the 4.7″ version is pretty close and not too much of a shock for long-time iPhone users. I mean, the 6 Plus is HUGE. Clearly, I would pick the 4.7″ version, right? But wait….the 6 Plus has a better battery, better pixel density, better camera AND a true landscape mode? $()*@#$&#@. 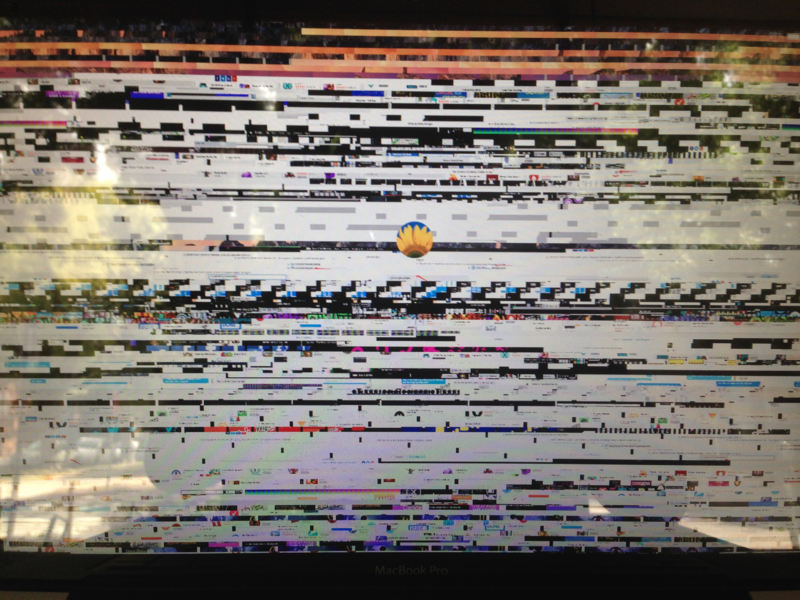 Thanks a lot Apple. Well, after agonizing over this admittedly small decision, I ended up choosing the 6 Plus. Why? Well, as my brother put it: FOMO. Fear Of Missing Out. Sure the 4.7″ would’ve been the safe choice, but what if the different user experience of the 6 Plus is amazing? What if it outweighs (pun intended) the physical drawbacks (read: “HUGE AND HEAVY BEHEMOTH”)? Well, in approximately 3 weeks I’ll find out. Oh snap! 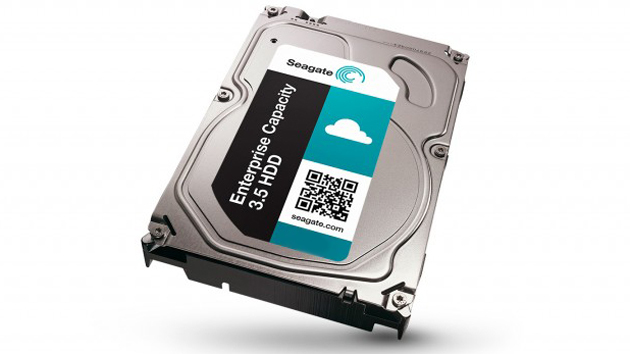 Seagate just announced it was shipping an 8TB 3.5-inch hard drive. It’s just for enterprise customers right now (which means NOT CHEAP) but it’s just a matter of time until consumers will be able to get their hands on this new Behemoth…which is what I hope they call the product when they sell it to consumers. More importantly, this new size class will (eventually) drive down the price of smaller but still hefty drives. In a fit of pique (and possibly stupidity), I have backed up my production OSX Mavericks install and have begun anew with OSX Yosemite (beta). Installation itself is pretty much the same as any other OSX installation and I had no issues at all. So far I have not encountered too many apps that do not run on the latest offering from Apple, which is good. I manually moved over my iPhoto and iTunes libraries without issues. iTunes 12 (beta) didn’t have any problems using the iTunes 11 library. If you have any apps that require Java, you’ll need to run the Java 8 beta – however I use Wuala for secure cloud storage and that couldn’t detect Java 8 which means that indirectly Wuala doesn’t support Yosemite. Speaking of iTunes 12, I haven’t played with it a lot yet, but yeah it looks different but no other MAJOR new features that I noticed. Just some subtle improvements. Rumor is that the store functionality may get an overhaul in the final release, but so far it’s the same experience, unfortunately. In the screenshot above, it happened on the login screen which was slightly inconvenient since I had to find the login box, but everything was fine after I logged in. Well, the flat/translucent design elements are nice and modern. They’re certainly different which is nice since I’m easily bored and I’ve had Mavericks for almost a whole year. Unfortunately, I won’t be able to test Handoff since my MBP doesn’t have the most current version of BlueTooth, and therefore doesn’t support the new feature. The Ducky Diaper. Yeah, it’s pretty much what it sounds like. A diaper. For ducks. OK, so I’ve been having some problems lately with the massive amount of crap crowdfunding projects, basically people asking you to donate money to them for basically nothing. I love Kickstarter and Indiegogo and the like, but I HATE having to sift through all the garbage to find the gems. Ducky Diaper isn’t one of those projects, it’s for an actual product. Now it’s not something that I find personally compelling, but different strokes for different folks and all that. I suppose there are those that think that diapers for ducks is a product that has a critical need. Think of all the spinoffs for the other potential pets. Doggy diapers? Cat nappies? The list goes on. The goal is to enjoy them as pets while they’re ducklings, then release them into the wild – So many things wrong with this…. Oh yeah, this guy is asking for $200,000. Maybe a bit much? I’m really really really not trying to be mean, but come on! For $50 you get a signed photo of a duckling. Signed by the duck? For $250 you get a set of diapers (unspecified amount) and food for your boy or girl. Not sure if it’s food for your human child or the duck, that also isn’t specified. Also, I don’t have children but I’m pretty sure $250 is way more than human diapers, unless you’re talking about a lifetime supply. Here’s a tip: you’re never going to reach that goal buddy. Maybe set a more realistic goal like I dunno, $5,000? Let’s keep in mind that ducks aren’t even legal as pets everywhere so your already small target niche is even smaller….With a goal of $200,000 and with Kickstarter’s all-or-nothing funding model, you’re pretty much guaranteeing failure. But that’s just my take. You can check it out for yourself. Or not. This one’s for all you HTPC nuts. 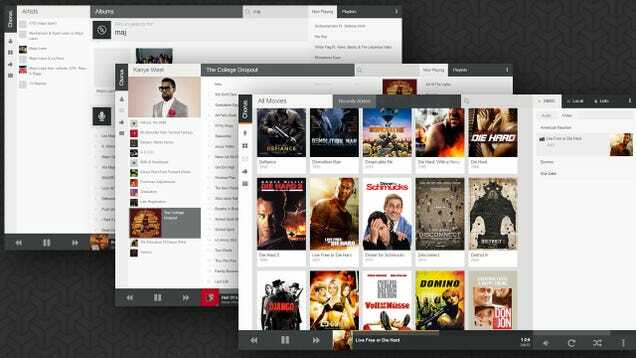 While there are other options, the majority of my friends sit in either the XBMC or Plex camp for HTPC media management. One of the nice features of Plex is the ability to manage, manipulate and stream your media from a web browser. Now, with Chorus, you can do that with XBMC too! If you open a port on your firewall, you could also stream media while you were away from your home. I use Plex, so I haven’t tested Chorus, but the features seem very similar. Chorus is free, and available in the main XBMC repository and is also available via GitHub. 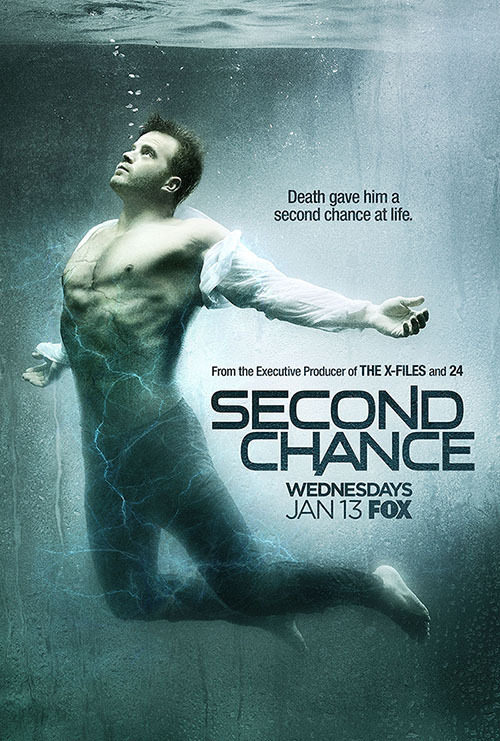 If you’re an XBMC user, let us know how you like Chorus, or if there are better alternatives. I drive a lot, so I’m a total navigation app junkie. I love Waze and have used it consistently for many years (still hoping for a premium service without the ANNOYING ads), and think it works the best overall. However, the newest Google Maps update for Android/IOS adds a couple of really cool features. Google adds to its already rich feature set by adding Uber functionality as well as beefing up its public transportation data (Waze doesn’t even offer anything except driving directions). However, the coolest new feature, at least for drivers, is the addition of lane guidance, so you won’t miss your exit on those tricky freeway off ramps. It’s a feature that other apps have included before…I remember Navigon added that many years ago. I took it out for a test spin, and it works really well, so it’ll be a great addition to those of you that prefer Google Maps.